At the invitation of the government of the Russian Federation, Special Envoy of President Xi Jinping and Vice Premiere of the State Council Sun Chunlan will travel to Russia to attend the opening ceremony of the 2018 FIFA World Cup from June 12 to 15. Q: Russian President Putin will pay a state visit to China, besides attending the SCO Qingdao Summit. Do you know the specific schedule of his state visit? A: This will be President Putin's first state visit to China since his re-election and also the first meeting between the two heads of state in 2018, thus boasting great significance in planning the future course of China-Russia relations and promoting all-around cooperation. During President Putin's visit, President Xi Jinping will hold large-group and small-group meetings with him. Besides exchanging views on bilateral relations, major-area cooperation and international and regional issues of mutual interest, the two presidents will jointly meet the press and attend signing ceremonies and welcoming banquets. As usual, the two sides will issue important political documents and ink cooperation documents covering a wide range of areas. These official activities aside, there are other highlights of President Putin's state visit, such as some people-to-people exchanges and cultural events where the two heads of state will engage in in-depth discussions amid a more relaxed and cordial atmosphere. We believe that with the concerted efforts of the two sides, President Putin's visit will be a fruitful and successful one, providing strong impetus to the development of China-Russia relations. Q: Does China have any comments regarding reports that the US military is considering sailing a warship through the Taiwan Strait? A: We have repeatedly emphasized that the Taiwan issue is the most important and sensitive one sitting at the core of the China-US relationship. The US should strictly adhere to the one-China principle and the three joint Communiqués and prudently handle the Taiwan issue so as to avoid harming bilateral ties and cross-Straits peace and stability. Q: State Councilor and Foreign Minister Wang Yi attended the Formal Meeting of the BRICS Ministers of Foreign Affairs in South Africa. Could you give us more details on this meeting? Under the current international circumstance, what special role can the BRICS cooperation play in addressing global challenges? A: On June 4 local time, State Councilor and Foreign Minister Wang Yi attended the Formal Meeting of the BRICS Ministers of Foreign Affairs in South Africa, which was held to lay the groundwork for the BRICS Summit to be held in Johannesburg in July. All participates had a robust exchange of views and reached important consensus on deepening BRICS cooperation, promoting common development, maintaining world stability and jointly rising up to global challenges. State Councilor and Foreign Minister Wang Yi pointed out that the world is witnessing unprecedented changes in a century and is faced with the challenges of "three deficits" in governance, trust and development. The BRICS countries have major international responsibilities when it comes to world stability and common development. The BRICS countries should hold high the banner of political settlement and seek to resolve hot-spot issues through dialogue and negotiation. We need to adhere to the principle of fairness and justice and maintain the fundamental norms of international relations. We should stick to the concept of multilateralism and bolster the central role of the United Nations in international affairs. The BRICS countries should make collective efforts to deepen pragmatic economic cooperation, strengthen political and security cooperation, and expand cultural and people-to-people exchanges. The BRICS should continuously expand the circle of friends with the "BRICS plus" model and join hands in addressing new threats and new challenges so as to create a more enabling and stable environment not only for their respective development but also for global development. We hope that the 10th BRICS Summit in Johannesburg in July and the Beijing Summit of China-Africa Cooperation Forum in September could complement each other and forge synergy in promoting peace and prosperity for Africa. 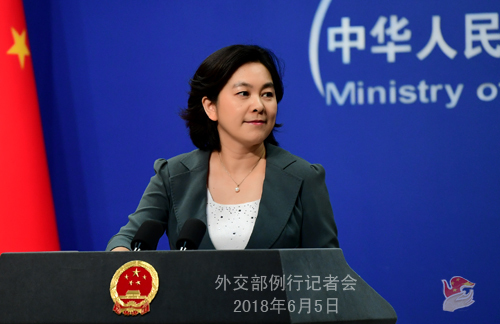 During this Foreign Ministers' Meeting, all participating foreign ministers spoke highly of the important contributions China made as last year's BRICS chair. It is agreed that with complex changes taking place on the international stage, the BRICS countries should strengthen coordination and cooperation, deepen strategic partnership, and work together to uphold multilateralism, oppose unilateralism and protectionism, and safeguard the basic norms of international relations. All participants also voiced their full support for South Africa in ensuring a successful BRICS Summit and committed themselves to sending positive and strong signals and contributing to global stability. 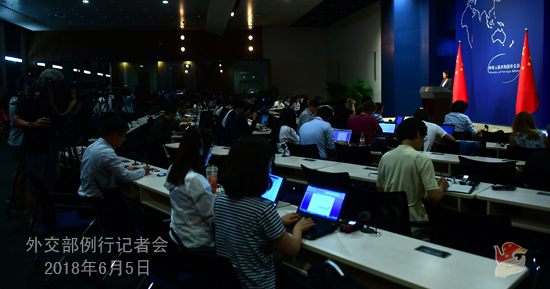 Q: On June 1, US President Trump told the media that as the US-DPRK relations are improving, he does not want to use the expression "maximum pressure" any more. What is your comment? A: In recent days all relevant parties have been closely following the progress in the preparations for the US-DPRK summit. We have noted that recently the DPRK and the US held close talks on their leaders' summit and made positive progress. We hope that the two sides could cherish the consensus and progress they have achieved, continue with their preparations for the summit, and keep moving forward along the right path of politically resolving the Korean Peninsula issue. Q: The Australian Foreign Minister recently criticized China for pressuring the airline Qantas to change how it refers to Taiwan on its website, saying that the activities of private companies should not be subject to political pressure. What is China's comment? A: I have noted relevant reports. There is only one China in the world and Hong Kong, Taiwan and Macao have always been parts of China. This is an objective fact, a common sense as well as the general consensus of the international community. The relevant issue is not a general procedural or technical one. What the relevant Chinese department has asked for is based on the consistent and firm position held by the Chinese government on the one-China principle and is thus legal and legitimate. It has nothing to do with the so-called "political inference" or "political pressure". All companies operating in China should abide by the Chinese laws and regulations and respect and follow the one-China principle. That is the least they must do. Q: A Chinese tourist group had an accident in Canada, with one killed and at least three injured. Do you have any updates? A: On the afternoon of June 4, a tourist bus with 35 Chinese citizens aboard had a traffic accident in eastern Ontario, Canada, killing one and injuring many. The injured were immediately sent to the nearby hospital. Upon learning the tragic accident, the Chinese Embassy in Canada and the Consulate General in Toronto activated emergency response mechanism at once. They contacted local police for more details and asked the Canadian side to find out the cause of the accident as soon as possible. They made clear that the travel agency involved should shoulder its responsibility and properly take care of such matters as medical treatment and compensation for the Chinese tourists. The Chinese Embassy staff in Canada have visited the injured in hospital. 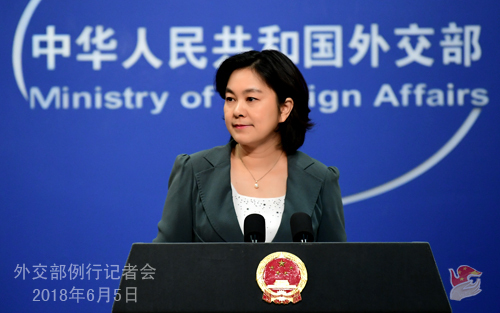 The Foreign Ministry has reached out to the relevant local government in China and asked it to urge the domestic travel agency to take up its responsibility. The Foreign Ministry and our diplomatic missions in Canada will continue to follow the development of the accident and work with relevant departments to make proper follow-up arrangements.